Stems: scape six-to-twelve flowered. Leaves: coriaceous, shining above, reniform, wider than long, crenulate. Flowers: racemose, nodding; petals five, obtuse; calyx five-parted, persistent, the lobes triangular-lanceolate; stamens declined; style declined and exserted. The tall red stalk of this Wintergreen, with its numerous nodding rosy blossoms, is exceedingly attractive, especially as it grows in the deep moist woods, where few flowers flourish owing to the absence of all sunlight. Very fragrant also is this quaint plant, to which the name of Winter-green has been given on account of its evergreen foliage. The long out-curved style, which protrudes far beyond the floral cup, is green, and has a dull red stigma, while the ten stamens are tipped by dark, slightly beaked anther-sacs. The calyx is entirely of a deep red hue, and the petals are bright-coloured at the outer edges, shading into palest pink in the centre. The leaves grow in a cluster at the base and are thick, tough, and glossy. A few narrow little bracts cling to the flower-stalks. Sheltered from the wind and the sun, half hidden by mosses and tangled undergrowth, but always preferring a damp spot to a dry one, the Bog Wintergreen grows in close companionship with the lovely One-flowered Wintergreen, the Long-bracted Orchis, and the Butterwort; and if you know the " Secret paths that thread the forest land," you may find them in profusion, mingled at your feet by happy chances, - a gay holiday throng. Pyrola asarifolia var. incarnata, or Red Wintergreen, has broadly oval leaves, rounded at the base, which are dull, thick and blunt at both ends. The rose-red flowers nod in a slender raceme and the style and stamens are declined. 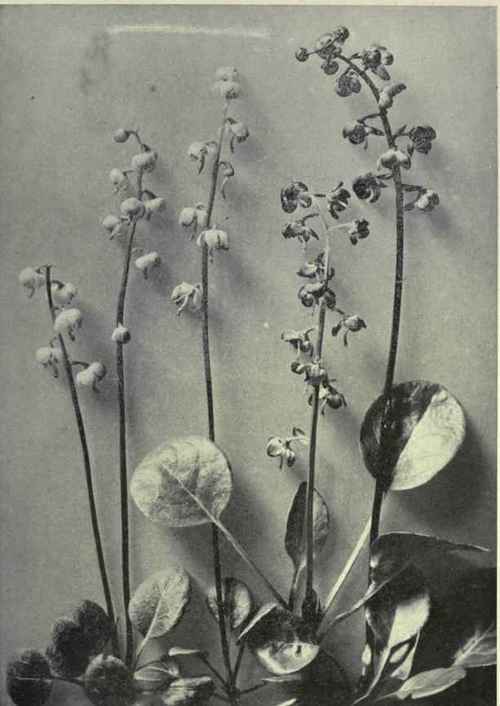 The chief difference between this species and Pyrola asarifolia is that its leaves are quite dull, almost leathery, while those of the Red Wintergreen are polished and shining.